The high priced DynastyMattress New Cool Breeze 12-Inch Gel Memory Foam Mattress is a top of the line item that gives customers everything they could ever want in a brand named mattress, from top to bottom. Besides the generous top part of gel memory foam buyers are treated to 4 layers of some of the best product on the market, all in one unforgettable package. With the inclusion of gel memory foam this model went from being just another memory foam to the perfect memory foam if you wanted something premium. The base hd memory foam contains better memory foam than the entire memory foam mattress construction of some competitors. As if that wasn’t good enough, it manages to be firm despite having the ability to huge the sleeper like a cloud. It’s the perfect balance of soft vs firm while also providing great mattress breathability so the user isn’t sweating in their sleep. The mattress is made to last for years with a base that is solid enough to last decades. If looking for the perfect way to turn your bedroom into heaven then look no further than this gel memory foam mattress. DynastyMattress is another one of those online companies that popped up in the middle of nowhere and set up online stores on sites like Amazon and other online retailers. The difference between this company and others is that they have gained some serious headway in the industry, and in such a quiet way that it’s hard to believe they are considered major competitors to Tempurpedic and even Sleep Number. The company makes a variety of beds that often have open descriptions describing which named brand bed their model is most like. This leads to a lot of people window shopping at name brand stores for the model they want, when in reality they are just shopping for a DynastyMattress model that best suits their needs. The prices ridiculously low to compared models, and the quality seems just about the same with little drop off. Add to that their 30 year warranty and 120 day no risk trial and it seems foolish to not at least give them a try. Their website is pretty sparse but they do have contact information and updated stock. With a little better care to the website layout they can really dethrone the kings of the mattress world. This is not just good quality, this is top quality that almost seems impossible for the price. The 4 layers of gel memory foam include 3 generous inches of gel foam, dual 2 inches of cool airflow foam and a steady base of 5 inches of high density foam. Great care was taken with the construction of this product, and not only does the mattress have great breathability, but it bounces back up to its original shape just seconds after you get off of it. This is a CertiPUR certified memory foam solution that passes all of the necessary tests, and the white cover that is included acts as a fire barrier. It’s hard to believe that something so beautiful with its brown suede on the corners could actually also be functional. King size is 118 pounds with dimensions of 80x76x12 so it’s a big boy and needs two people to handle it. Gel memory foam is usually overly soft, but this version of it manages to keep things firm yet manageable for those that want the best of both worlds, but don’t want to lose the benefits of gel memory foam. Without a doubt the gel memory foam that captures the essence of what the perfect middle point is when trying to please everyone with firmness. There are few people that lay on this and are unsatisfied with how it contours to their body, or how quickly it recognizes their body heat. Gel memory foam by itself offers breathability options in the foam that isn’t available in regular memory foam. Add to that the dual layers of airflow foam sandwiched in between, and consumers have the perfect 3 layers of foam for any climate since it can regulate body temperature a lot better. Of course mention has to go out to DynastyMattress for the 120 day trial period, where the user only has to pay shipping to send it back if they’re dissatisfied. Even if things don’t turn out the way you want with this gel memory foam, you can return it at little cost to yourself and even smaller headache. Not even some of the big name brands offer such a guarantee, and it just goes to show how much DynastyMattress stands by their product. This is one of the best gel memory foam mattresses on the market right now. Definitely the TEMPUR-Cloud Prima would be the closest match, and not surprisingly the DynastyMattress retails for less than half the price. It’s an incredible deal, which has a lot of people wondering how they do it. There really is no noticeable difference between the two beds, and some may even say that the DynastyMattress feels better, since the TEMPUR-Cloud Prima may come off as a bit softer in comparison. It’s baffling, but a lot of what is in stock has comparable items at a fraction of the price-this is not an anomaly at all. Owning a gel memory foam mattress doesn’t have to cost so much that it makes you take out a second mortgage. Memory foam is the same quality across all vendors, it just depends on what materials they decide to splice it with. DynastyMattress has proved this time and time again, and is amazingly competing with the bigger brands in the industry and not even batting an eye while they do it. The free trial period is a can’t miss opportunity for customers looking to get on the gel memory foam bandwagon, and as such there really is no reason to not at least give it a try. The price is going to stay high, and isn’t going to go down at all. There have been shortages in stock on some models, with this particular item only being available in king size at the time of this writing. 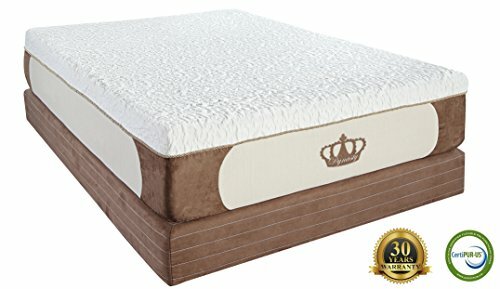 If by some miracle buyers find this model at a lower price, they should grab it and never let go-you’ll never get that opportunity again to get a high quality gel foam mattress that cheap. Around the holidays during gift giving season look for these and other models to be out of stock. At one point the idea of a small online retailer rivaling brick and mortar mattress giants was unthinkable. But the line in the sand has been drawn, and it’s been anyone’s game for years in the mattress industry since everyone has started using foam. The trial period of 120 days puts this item over the top and makes it a must buy if users are looking to get a mattress. There are many options out there, but none as feature rich and as risk free as what DynastyMattress is offering its loyal customers. Make sure to compare in store with a brand name to find out what DynastyMattress best fits your needs.